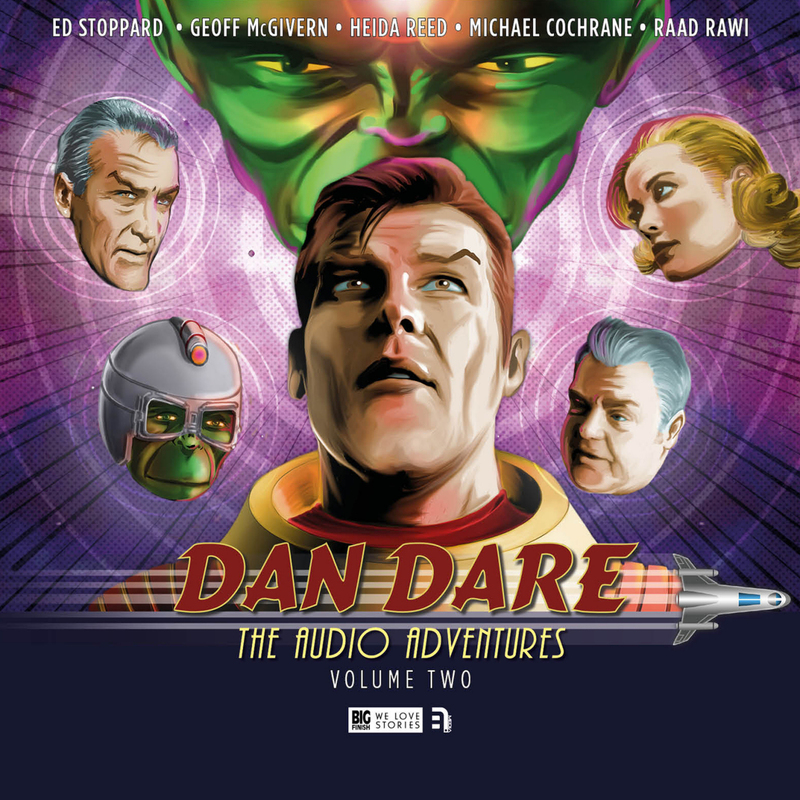 Beginning where December’s Volume 1 left off, B7’s reinvention of the classic British space hero continues with a second volume of Dan Dare – The Audio Adventures. For the uninitiated, Dan Dare is a bona-fide British sci-fi icon. First gracing the pages of ‘The Eagle’ comic in the 1950s, Dare is a dashingly heroic test pilot for the Spacefleet, imbued with a strong sense of morality and a healthy disregard for the rules. Recruited to lead the crew of the space ship Anastasia through mankind’s first steps into the solar system, Dare (Ed Stoppard) is ably assisted by the gruff, pessimist Lieutenant Digby (Geoff McGivern of Hitchhiker’s Guide fame) and the brilliant scientist Professor Jocelyn Peabody (Heida Reed). In the first volume of adventures, drawn from the original comic strips, the Anastasia took its maiden flight thanks to retro-engineered technology and made both friends and enemies on Venus. Dare defeated the cold and calculating Mekon (Raad Rawi), the self-styled Supreme Leader of the Treen, freeing his subjects from an oppressive regime. Deliberately infected by a virus so that they would never be able to safely return home, the crew ended up using a matter transporter to cleanse themselves and it is here where Volume 2 starts. The adventures resume with the revelation that time dilation has caused the Anastasia’s crew to be away from Earth far longer than expected. In their absence, the planet has been invaded and humanity toils under the jackboot of new robotic masters. Naturally, it is not long before the crew find the Mekon lurking at the heart of the occupation; his subjugation of the human race all part of a ghastly experiment. With our heroes captured, there are some harrowing darker moments and we are left with no illusion as to what the villainous Mekon is capable of. There is a vivid sequence where Dare and his crew hear a survivor’s tell of how the Earth fell, which boasts some impressive sound design which had me enthralled and of course, amid the horrors, there are always the embers of resistance. As the planet celebrates VM day (Victory over the Mekon), Dare is back in action when a long since missing ship, the Nautilus, returns. Using an experimental drive system, he travels to Jupiter and encounters the Nautilus’ sole survivor, and augmented human and former Eagle Corporation scientist named Blasco. With a charismatic performance, Jonathan Rhodes impresses as Blasco, a man who has sold out the human race and created some highly dangerous technology with his Black Cat drones. Blasco has also thrown his lot in with the Vora (Nicholas Briggs), a gargantuan, encounter suited monstrosity that dominates life on the Saturn colonies and who may pose an even greater threat to the solar system than the Mekon. The Mekon returns with a fresh scheme to be rid of Dan Dare once and for all, but despite a meticulous plot designed to satiate his desire for revenge, the villain fails to anticipate a single rogue element, namely one Cadet Flamer Spry. As well as the obvious threat, there is also a political backdrop to this tale which adds a further dimension. Series editor Colin Brake neatly pulls together threads from the whole set, with an unsettling revelation or two, as well as reminding us of the boundless scope for further adventures. Dan Dare may have been your Dad’s, or even your Grandad’s, boyhood hero but there is certainly nothing dated about this reincarnation. Instead, the audio adventures have taken the well-drawn characters of that post-war era, with their defining qualities of optimism and morality, and let them loose with modern sound design and a terrific, bombastic score from composer Imran Ahmad. Dare’s new future includes a history which references the space race of the 1960s and nods to concepts like hacking, undreamt of when the comic strips were created. This future is nuanced too, gaining depth from some of the concerns of the present day, such as the power of corporate influence on the military and its private agendas. The three heroic leads, Stoppard, McGivern and Reed seem well at home with their characters and, as much as the stories are absorbing, the interaction between the three is entertaining in its own right. Dare’s unstoppable quest for adventure is tempered by reflection, Digby manages to be heroic despite his sarcasm and has plenty of witty comic asides, while Peabody’s professional detachment continues to teeter on the edge as she is caught between responsibility to her masters and loyalty to her friends. For me though, the highlight of this trio of stories is Raad Rawi’s thoughtful take on The Mekon. You can almost hear the wheels turning inside that oversized cranium as he plots, and he falls into childlike tantrums when Dare gets the better of him. Far from simply a comic book villain, the Mekon becomes a desperate figure; far from the objective scientist, he is blinded by his hatred and driven by a need to understand how he was beaten by a creature from a species he views as inferior. The three stories in this set are accompanied by a rather interesting bonus documentary ‘Dan Dare – 21st Century Spaceman’ presented by Richard Hollingham (a space and science correspondent) which looks at Dan Dare’s history and how his adventures have informed real life rocket scientists. There is also time for some interviews with the actors, as well as reminiscences about the character’s history and some of the odder merchandise. Dan Dare tooth powder anyone? For me, this audio revival of Dan Dare is a triumph. Each of the three episodes have the feel of an audio movie and it is easy to get pulled into their world. I cannot wait for the Anastasia to get back out there and explore this universe, and gladly give it square-jawed, generation gap busting 10/10.